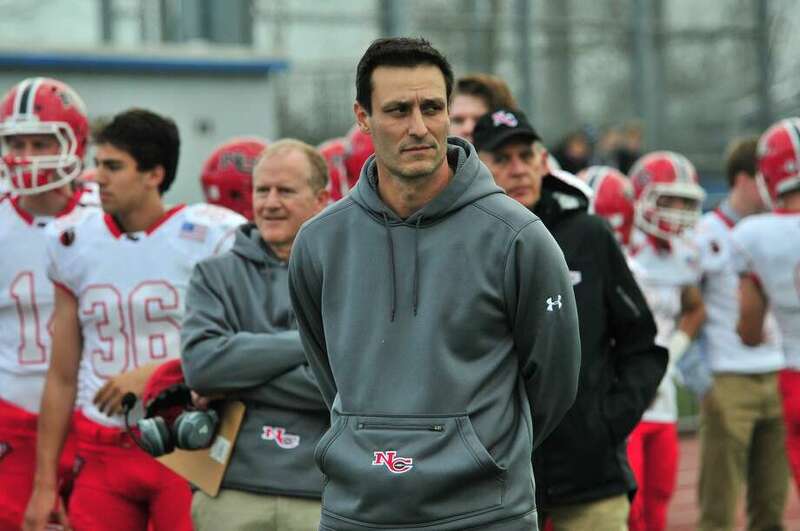 New Canaan defensive coordinator Chris Silvestri has been at the position for 17 years. NEW CANAAN—The judgement on Chris Silvestri from those in New Canaan will vary depending on which generation you ask. Those 35 and over will remember the Rams star running back and safety, who played in the early 90’s and holds virtually every rushing record in New Canaan as well as being the winner of the Gatorade Player of the Year in his senior season. Those younger will speak of the New Canaan defensive coordinator, who was helped the Rams win 12 state titles in his time as a coach. After playing in college at Lafayette and Fairfield University, Silvestri knew he wanted to stay around the game. Since then, he’s slid right into a culture that produces champion after champion. And it’s no accident. While that basic foundation remains constant, the game is ever changing, and one of the things that makes New Canaan so continuously strong it the ability to keep pace. Silvestri couldn’t wait to play for Marinelli growing up, and now gets to use him as a sounding board and voice in his ear while coaching the defense. Each of the last several years, Marinelli has listed the defense as a question mark heading into the season, trusting completely that Silvestri will get it figured out. “A good offense helps,” Silvestri laughed. “That’s certainly a good thing when you’re putting stress on teams offensively and teams are trying to play catchup. For the most part it’s the kids, they buy in to what we’re doing, most have chips on their shoulder when they go out and play.